Despite what sport or workout you do, recovery is crucial. Without taking the time to rest and recover, you risk overtraining and making yourself more prone to injury. You’ll also feel not as great as if you’ve had the proper rest that you need. So how do you recover and do recovery times and methods differ for each workout? Find out here. Hydration is key. You sweat a lot from moderate to intense cardio so make sure that you replace lost fluid. If you weren’t drinking water throughout your workout either, drink even more. If you’ve only done moderate level cardio, then It’s best to stay away from sports drinks that are marketed towards athletes. These drinks contain high levels of sugar that aren’t needed for moderate workouts. You can drink these sports drinks and other liquids with electrolytes after longer cardio sessions. HIIT, or High Intense Interval Training, consists of short bursts of extreme exercise followed by rest break. This definitely gets your heart ramping up a lot quicker than LISS or moderate exercise. You’ll also be burning calories after your workout thanks to a process called post-exercise oxygen consumption. EPOC refers to the amount of oxygen it takes to restore your body to its normal state. HIIT boosts this process. As well as drinking fluids and making sure that you’re hydrated, make sure you eat a meal rich in carbs and protein (3:1 ratio is ideal). This way, you are feeding your body the fuel it needs by letting your muscles grow and restore glycogen stores. HIIT is very taxing on the body so it is best to give yourself one full day in between to recover. Doing it every day or even multiple times a day can really increase your risk of overtraining. Do yourself a favor, and take a break. After a run, you would have sweat quite a bit. So, surprise, surprise, you will need to restore your fluids. Water and/or electrolytes is your number one priority. Believe it or not, chocolate milk is one of the best post-running drink/snack that you can have. It embodies the 3:1 carb to protein ratio that you need, and of course, it’s delicious. Have a well-balanced snack or meal as well. Just remember to incorporate rest days into your schedule. Running puts a lot of stress and pressure on your joints, so it’s crucial to give them a break. At least one rest day a week is ideal, and maybe even two. If you find it difficult to take a break, it doesn’t mean that you have to be sedentary the entire day. Go for a walk, or do some low-impact activities. Swimming is a great one because it takes the stress off your joints, while still allowing you to get some exercise in. As strength training focuses primarily on the muscles, you’ll need to make sure that you consume protein and a good amount of carbs after a workout. You would have depleted your muscle stores so it’s important to refuel. This will aid in recovery as well as promoting muscle growth. You’ll also need to ensure that you drink water and have a good, filling meal. Stick to the 3:1 carbohydrate/protein ratio to maximize recovery. The recovery times and rest days in between strength training greatly depends on your workout schedule. If you split your days between muscle groups, such as back, shoulders, legs, etc, then you can get away with training 5-6 days with one rest day in the week. If you train the same muscle group in a row, give yourself at least a days rest in between to recover. While the general rule of thumb is to give the same muscle group a rest day, minimum, in between workouts. Otherwise, you risk overtraining. And at the end of the day, just listen to your body. If you’re feeling the effects of training that transcends beyond normal DOMS (delayed onset muscle soreness), then take a break. You won’t ruin your progress by taking a couple of days off, in fact, you’ll probably help it. Make sure that you always warm up before your workout and stretch afterwards. It’ll facilitate the muscle recovery process and help to speed it up. It might be a good idea to foam roll as well. This will lessen the recovery times for each activtity. Track your training, record your progress, and customize your workout plan with Jefit. 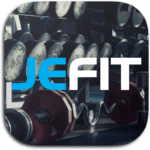 Jefit is a workout log app that provides you with all the tools you need to hit your fitness goals. We even have a members-only Facebook group where you can connect with like-minded people and share fitness and nutrition tips and advice.